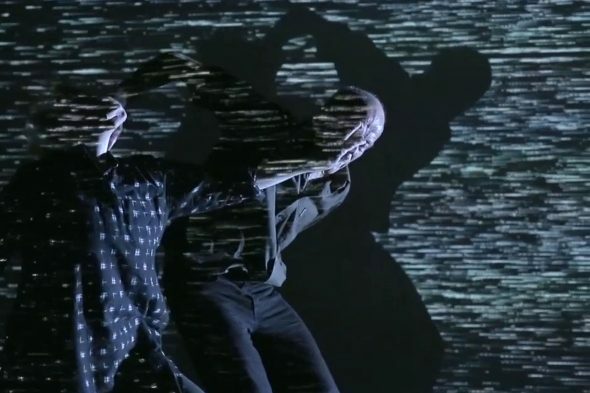 De Quincey Co present METADATA, in association with FORM Dance Projects and Dancehouse, in the Lennox Theatre, Riverside Theatres, Parramatta. (Sept 15-17). METADATA is a program of two works by De Quincey Co. The first is PURE LIGHT, danced and choreographed by Tess de Quincey. It is, says Ms de Quincey, 'a homage to the fluorescent light installations of American minimalist artist Dan Flavin (1933-96),(where) a space is sculpted by light and colour to explore impermanence.' In a Design by Martin Fox, which had the emptied stage space of the theatre flanked by a string of white fluorescent lights on both sides, and a ground spread of coloured fluorescent light at the base of a large screen, onto which video images of varying forms and shapes were projected, a solo figure in a white hooded opaque costume (Claire Westwood) explores impulses to movement - all the elements of the movement practice of Ms de Quincey's dance philosophies originating and evolving from the teaching of Butoh dancer Min Tanaka and his Japanese Company, Mai-Juku, known as BodyWeather. From the almost imperceptible start of the performance by Ms de Quincey through permutations of various stretched body shapes and paced movement, it is framed by the video images that constantly create visual contexts for the action. The visuals and the Sound Composition by Pimmon (Paul Gough) are integrated with the beautiful movements created, the costume and body hauntingly shadowed, on the screen, to add duet dimension to the work. I found the work minutely beautiful. Unfolding the space between two beings, the underlying physics and mathematical relationships that shape life and matter are explored. Bodies are moved by environment to reveal microscopic realms and a monumental universe of immense scale. We wanted to make performances that are informed by the underlying physical and mathematical patterns that determine and shape our lives and possibilities. For me, less the dance than the visuals produced the 'monumental universe(s) of immense scale' of the mathematical patterns that determine and shape our possibilities. Afterwards, there was an Arts-Science exchange, facilitated by Associate Professor Ian Maxwell, Department of Theatre and Performance Studies, at the University of Sydney, with, at this performance, Professor Geraint F Lewis, Professor of Astrophysics, Sydney Institute for Astronomy, also from the University of Sydney. Professor Lewis is not an artist, or even much of an attender of the performance arts in general, let alone dance, he confessed. (I suspect, this kind of performance may have been a new experience for him.) What was interesting in the brief discussion that followed the dance works was the fascinating conversation and ease of communication concerning physics, astrophysics and mathematics that Professor Lewis had. The conversation for us non-physicists was attractive and educational (in the good sense of education.) The extrapolation of the conversation to the actual Dance program was less lucid and seemed mostly irrelevant despite the attempt by Professor Maxwell to draw out possibilities of the dance to the concepts of the Scientist. It seemed to me that most of us endowed the work, in its experiencing, to the possibility of revealed 'microscopic realms and monumental universe of immense scale', from the accompanying Visual work of Mr Baggatini and the Composition of Mr Burt, than the dance of either of the artists. That, generally, METADATA, was more a zeitgeist title for a dance project, than an actual investigation of the science through dance/movement. I recollected the Shaun Parker work, AM I, as a more deeply integrated investigation of an element of science with dance and movement, that was most invigorating on both counts: The Arts (Dance) and Science. As far as Science and Arts were concerned the Ryoji Ikeda SUPERPOSITION, seen at Carriageworks last year had a better balance of impact. Still, this was an engrossing performance and more so to have the experience of witnessing the gifts and uncanny communication between Ms de Quincy and Mr Fraser, two Dance artists of great and committed vision and discipline. Two Australian icons of Dance/Movement that keep working to deepen and contribute to the fabric of Australian innovation and art practice as best they can, even in the relatively 'hostile' environment of our current government. Originally, the work was developed with the support of the Australia Council and VicArts with a special grant from Dancehouse. Because of the changes to the funding models for the Arts recently experienced in Australia this work experience in Parramatta was made possible only by the support and faith of the two presenters of this work: Dancehouse in Melbourne and Form Dance in Sydney. Congratulations. With thanks and gratitude.